To what extent are newborn brains designed to operate over natural visual input? To address this question, we used a high-throughput controlled-rearing method to examine whether newborn chicks (Gallus gallus) show enhanced learning of natural visual sequences at the onset of vision. We took the same set of images and grouped them into either natural sequences (i.e., sequences showing different viewpoints of the same real-world object) or unnatural sequences (i.e., sequences showing different images of different real-world objects). When raised in virtual worlds containing natural sequences, newborn chicks developed the ability to recognize familiar images of objects. Conversely, when raised in virtual worlds containing unnatural sequences, newborn chicks’ object recognition abilities were severely impaired. In fact, the majority of the chicks raised with the unnatural sequences failed to recognize familiar images of objects despite acquiring over 100 h of visual experience with those images. Thus, newborn chicks show enhanced learning of natural visual sequences at the onset of vision. These results indicate that newborn brains are designed to operate over natural visual input. The visual sequences. Newborn chicks were raised with three sequences, each consisting of three images. The natural sequences consisted of different images of the same object, separated by 45° rotations in the depth plane. The unnatural sequences consisted of different images of different objects. The natural sequences and unnatural sequences were composed of the same nine images. 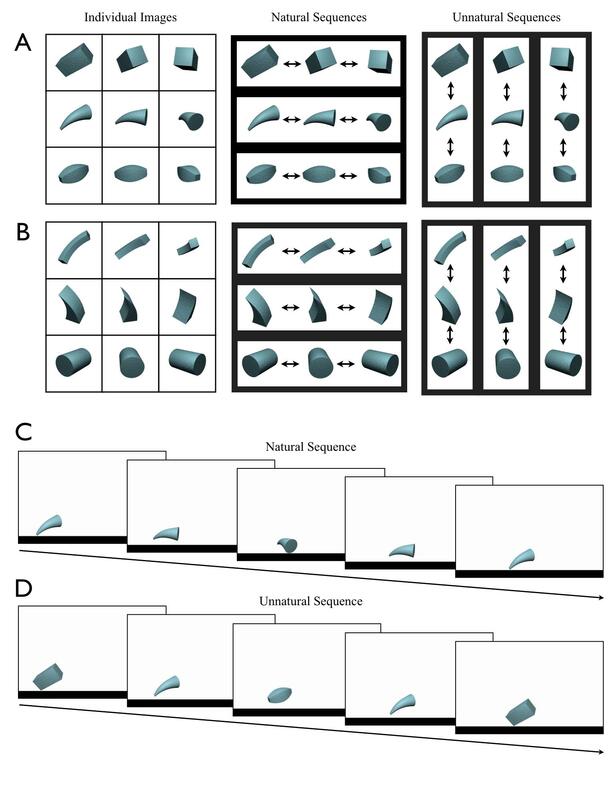 Half of the chicks were imprinted to the images shown in panel (A), while the other half of the chicks were imprinted to the images shown in panel (B). Panels (C) and (D) show an example of a natural sequence and unnatural sequence moving across the display wall. Results. (A) The chicks’ overall recognition performance when the novel images were presented as natural objects versus unnatural objects on the Novel Image Test Trials. 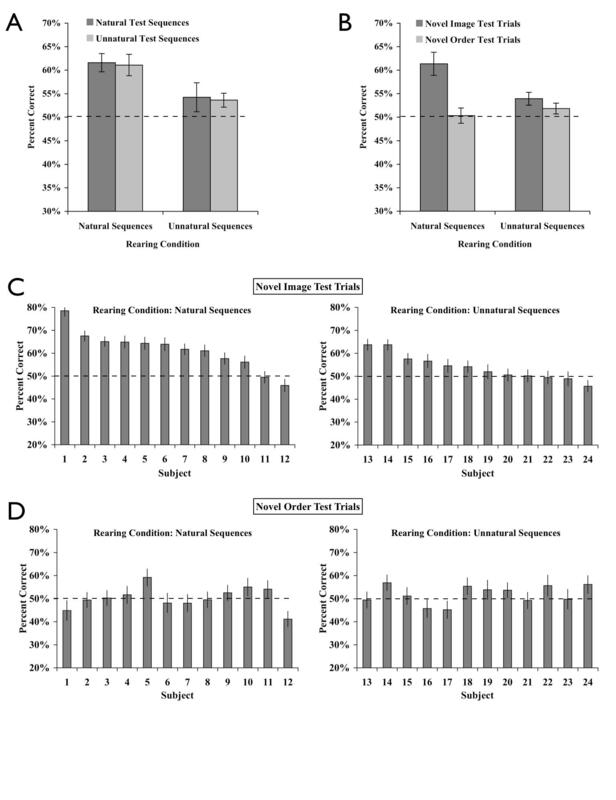 (B) The chicks’ overall recognition performance on the Novel Image Test Trials and the Novel Order Test Trials. In general, the chicks raised with the natural sequences showed enhanced recognition of novel images compared to the chicks raised with the unnatural sequences. (C) Performance of each individual subject on the Novel Image Test Trials (ordered by performance). (D) Performance of each individual subject on the Novel Order Test Trials. The graphs show the percent of time spent with the imprinted sequence compared to the unfamiliar sequence. The dashed lines indicate chance performance. The error bars indicate standard error.